As time went on Nand Lal went to school at the mosque [Maktab – for his education] on a daily basis. Here he was made to study Persian and all forms of Islamic knowledge. His brilliance and wisdom improved through steady practice. The great light of knowledge began to shine within him through his relentless learning. Nand Lal read large collections of books and as a result became knowledgeable and accomplished in the subject of Islamic literature and learning. Within society, Nand Lal was quick witted and spoke on important subjects intelligently. In this way, his excessive knowledge in all things became most apparent. As he grew up he took a keen interest in the political and administrative affairs and eventually took over his father’s job as a Munshi [administrator] after he passed away. His destiny however, was not to remain in Afghanistan. After marriage and the birth of two sons, he left for India where he found employment in the Mughal court at Agra where he served the crown prince Bahadur Shah, who was to become the future Mughal emperor. As the tradition goes, Aurangzeb once assembled his court mullahs and Islamic scholars of Delhi to have them interpret a certain verse of the Qur’an. Each of Qur’anic scholars came up with different interpretations based on the traditional Islamic tafsîr commentaries, yet none of them satisfied the emperor who got weary of the many failed attempts of fresh, innovative and skillful exegesis. After hearing about emperors distress via Bahadur Shah, Bhai Nand Lal volunteered to study the verse and come up with an interpretation. After the emperor had heard the exegesis of Bhai Nand Lal, he was so fascinated that he wished to meet Bhai Nand Lal in person. During the meeting, Aurangzeb bestowed the title of “Mullah Goya” on him. However, when he found out that Bhai Nand Lal was a non-Muslim, he gave Bhai Nand Lal the opportunity to convert or die, as it was a shame to have such talent wasted as a non-Muslim. Bhai Nand Lal chose to leave the court during the night and sought shelter at Anandpur where he met the young Guru Gobind Rai. 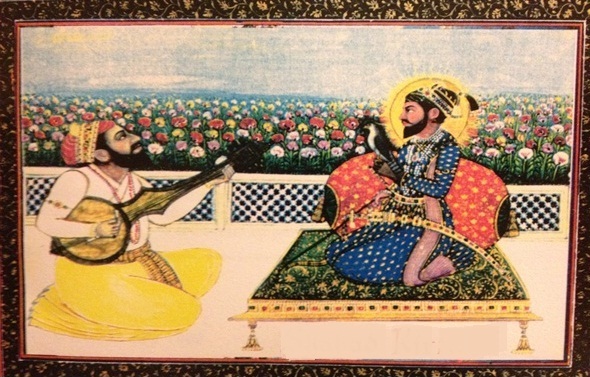 the musician most likely being a descendant of Bhai Mardana. In the City of Bliss, thousands of residents lived, studied and worked in the near presence of their Guru and Master. Furthermore, thousands of pilgrims came from far to see their Guru and amongst all of these, Bhai Nand Lal acquired a special place in his Guru’s heart. Many different stories from Anandpur relate how Bhai Nand Lal was praised and honoured by the Guru who called him his own jewel, while others indicate that he was part of an inner circle of close and beloved devotees. While the evolution of the Adi Granth to Guruship was publicly announced in 1708, Bhai Nand Lal was given this information in a private conversation in 1695, that is, 13 years before it was announced to the world. As history shows, the Sikhs applied the title of ‘Bhai’ to the poet which indicates that Bhai Nand Lal had mastered all of the above qualities and was hence worthy of the title of ‘Bhai’. Nand Lal performed two tasks simultaneously: He studied Persian and acquired knowledge thereby sharpening his mind. Nand Lal became a proficient scholar of Persian reading and memorising a large number of Persian books. He became privy through constant study and practice to the knowledge and etiquette required of the royal darbâr. Through such dedication he became a renowned servant of the court securing a post in the retinue of the prince whom the world later called Bahadur Shah. He was appointed the Shah’s Mir Munshi and his reputation increased day by day. Through contact with the Philosopher’s stone iron turns into gold. A devotee is both agreeable and happy when he meets with the true guru who looks upon him mercifully. At that moment the resplendent light of the divine shines in the heart. Such contact ensures that one is free from doubt, his heart and mind achieve samadhi, a condition of deep meditation, and from the great bewitching sleep he is awakened. Bhai Nand Lal was one such beloved. As Guru Nanak says of such devotees: ‘It is through the grace of the Lord, the one who bestows grace, O Nanak, that one becomes blessed. After the evacuation of Anandpur in late 1704 the whereabouts of Bhai Nand Lal are uncertain. Some traditions hold that he went back to the Mughal court in Delhi from where he worked under the later Mughal emperors Bahadur Shah and Farruk Siyar. Considering the poet’s background as a deputy governor, political administrator and his relations with the earlier Mughal emperors it is a possibility that the Guru, after the evacuation of Anandpur in 1704, send the poet back to Delhi to infiltrate the Mughal court with a mission, where he was to lobby for the Sikh faith and people during these two emperors’ persecution of the Sikhs. Towards the later part of his life, he settled in Multan where he opened a school that freely taught Arabic and Persian, most likely under state patronage during the era of the Sikh kingdoms. This school continued all the way up till 1849 with the annexation of Punjab.